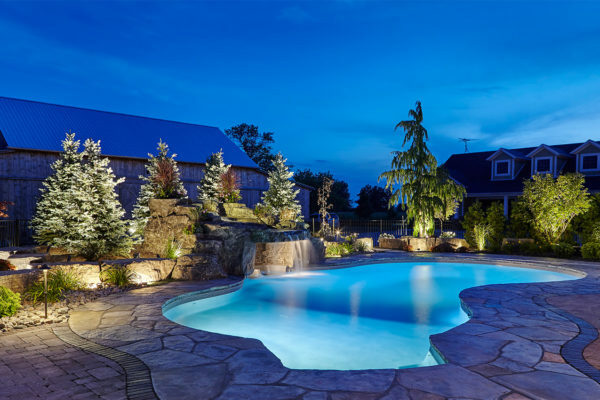 Landscape Lighting - Bellaire Landscape Inc.
Light Up Your Night with Outdoor Landscape Lighting! With the judicious use of light, we can extend our enjoyment of the breathtaking beauty of natural landscapes far into the night. You will be able to spend more time at night relaxing in your outdoor paradise with the addition of nightscape lighting to your surroundings. Nightscape® Lighting utilizes the power of low-voltage light and the elements of architectural design to help you create the perfect ambiance and illuminate your landscapes. Bellaire Landscape can professionally design your outdoor landscaping so that you can enjoy it all through the day and night. Our outdoor lighting products come in various finishes. The lighting fixtures will be carefully selected to match your landscape décor. We have simple or elegant outdoor lighting fixtures that can mount to walls, ceilings and be placed underwater. These outdoor lighting fixtures will help light up your entrances, paths, walkways, porches, and swimming pools or ponds. Imagine sitting in your gazebo or pergola with the gentle ambiance of outdoor lighting over head providing the perfect amount of soothing light to increase your night time enjoyment of the outdoors. Whether you choose a more dramatic or subtle outdoor lighting style, landscape lighting will add a new dimension to an already beautiful space. © Copyright Bellaire Landscape Inc. | Website created by webplanet.ca.